Canadian linebacker Jonathan Kongbo, who played collegiately at Tennessee, is making strides from a torn ACL and expects to be ready for NFL mini-camps or CFL training camp, according to a report from TSN's Farhan Lalji. 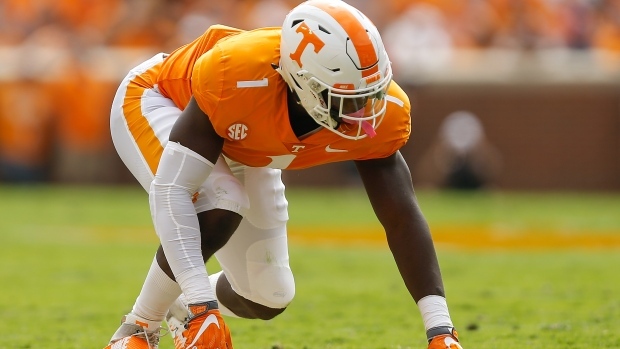 Kongbo, who fell from first to fourth on the CFL Scouting Bureau rankings after his injury, could be a late-round draft pick or undrafted free agent in the NFL. Lalji reported Kongbo has received strong interest from the San Francisco 49ers and Arizona Cardinals while adding the Surrey, B.C., native is open to options in both the NFL and CFL. Still recovering from his torn ACL, Kongbo only took part in the bench press at Tennessee's Pro Day earlier this month, finishing with 20 reps.